Information you provide on a TAC certificate of capacity helps us make claim related decisions to better support your patient's independence, recovery and return to work. When you accurately complete a certificate of capacity you provide critical information about your patient's injuries and their capacity for work and help to facilitate better outcomes for your patient. Frequently asked questions - Information about accessing and completing the TAC Certificate of Capacity. The Certificate of Capacity has been designed to support international evidence that says in general, work is good for a person's health and well-being. This brief video demonstrates how to complete the Certificate of Capacity. Use the Certificate of Capacity to provide guidance to your patients about what they can do after their injury. Encourage work as part of your patients' recovery and recommend a graduated increase in activity. 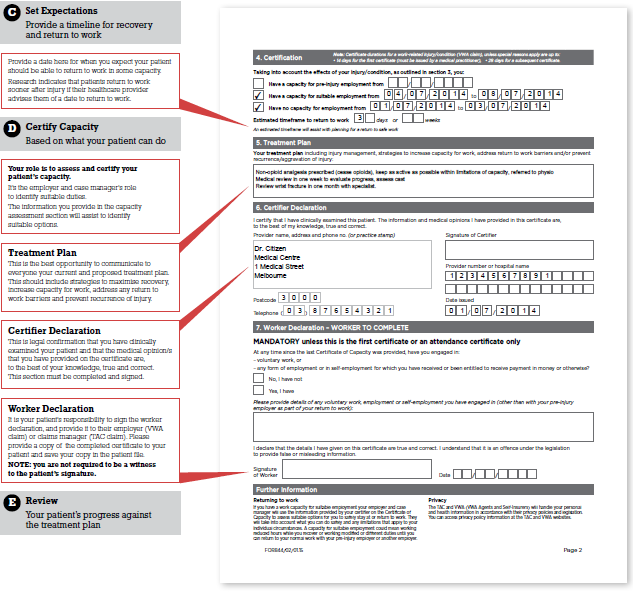 Provide a timetable for recovery and return to safe work. Patients are more than twice as likely to return to work early if they're given guidance on how to prevent recurrence and re-injury. Patients are more than three times as likely to return to work soon after injury if their health professional gives them a date to return to work. 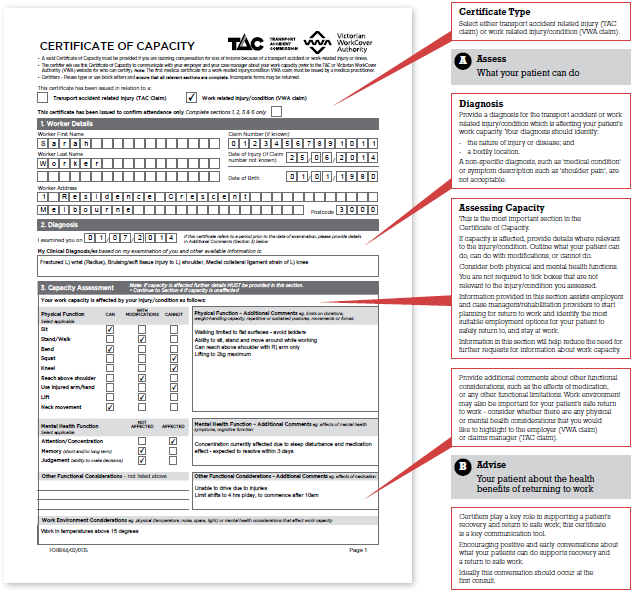 The Transport Accident Commission (TAC) and the WorkSafe Victoria (WorkSafe) have redesigned their Certificate of Capacity and medical certificates, resulting in only one form. Consultation and input from a range of external and internal stakeholders including clinicians and peak bodies went into the new certificate for improved usability. The new certificate design supports the latest evidence that, in general, work is good for health and wellbeing. Having early conversations between certifiers and patients significantly increases the likelihood of early return to safe work. The certificate aims to improve the information exchange about work capacity and encourage a positive focus on what an injured worker can do. The new certificate is more accessible than ever before with improved functionality and availability through the TAC and WorkSafe websites. For General Practitioners, the Certificate of Capacity is available through common clinical software packages to align with current workflow practices. There is compelling evidence that, in general, work is good for health and wellbeing. Conversely, the evidence also says long-term work absence, work disability and unemployment have a negative impact on health and wellbeing. Clinical software user guides - Step by step guides for Best Practice and Medical Director software. Other clinical software vendor information - Information on the type of template and the name of the template for each of the relevant software packages.